Sun Prairie and Madison Hot Tub Dealer Shares 3 Ways to Achieve a Positive Attitude. Offers Free Hot Tub and Swim Spa Test Soaks to Local Residents. Fred Bachmann, President of Bachmann Pools and Spas says, “October is positive attitude month, a time to take stock on personal outlooks and find ways to increase positivity.” Here are important habits that anyone can use to attain a positive attitude. 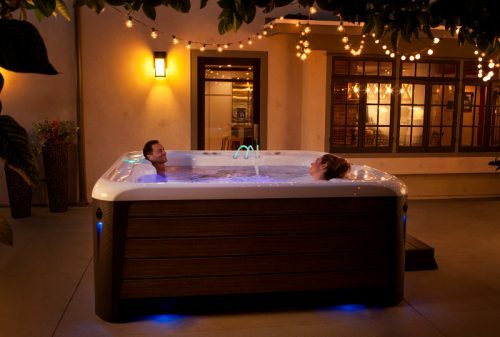 Create a Place for Peace and Tranquility with a Hot Tub – Find a way to make the home a place that everyone in the family can come to at the end of the day and relieve all of the stress, anxiety, anger and frustration they come in contact with during the day. One of the most powerful things people can do to make their home a place of physical, emotional and mental therapy for a more positive attitude in life is to add a hot tub to the yard. Placing a portable spa on a patio or porch makes getting in and out of the hot tub convenient for any season and adds luxury to the home as well as tranquility and comfort. Hot tubs create a therapeutic atmosphere in the yard in many ways. The heat and soothing massage work out tensions and improve blood flow while the buoyancy of the water lessens the physical pressures that create pain and tension in the body. Built-in stereo systems and lighting also create a positive, fun place to enjoy spending time together in a healthy environment. Remember, Positivity is a Choice – Always choose to be positive. There are a many little choices people make every day to be optimistic or pessimistic in their outlook to what is going on around them. People can increase their positivity by reminding themselves regularly throughout the day that being positive is a choice they can make to live better. Hang with Happy People – Negativity breeds negativity, and positivity breeds positivity. People should be aware of those they surround themselves with so that they don’t bring negative emotions into their lives and increase the difficulty for their own optimistic lifestyle. Remember that everyone has difficult times, challenges and even serious issues to deal with in life, and those things happen all the time. Dealing with the issues in a positive mindset will make them easier to handle and offer a better chance for a more successful outcome. To encourage residents to check out the benefits of owning their own hot tub or swim spa, Bachmann’s will be providing free test soaks for the entire month. They do recommend, however, that people wanting to schedule their free 30-minute test soak call them ahead of time to reserve their spot. To learn more, pick up a copy of this free Hot Tub Buyer’s Guide - 5 Easy Steps for First Time Buyers. Just call at 608-222-7727 or go to https://Bachmanns.com. Bachmann Pools & Spas, LLC was established in 1985 in Madison, Wisconsin. Since 1986 they have been a Hot Spring Spas Dealer and Warranty Service Center in good standing. They are an award-winning company with numerous local affiliations and strong ties to the community. Their product line includes: Hot Spring Spas, Endless Swimming Pools and Helo Sauna and Steam rooms. At Bachmann Pools & Spas they understand that they are in the service business, and that their ability to provide excellence in customer service is a direct result of the level of training and the desire of each employee to go the extra mile for their customers. Their goal is for each employee, regardless of position within the organization, to use their own judgment and act as owners of the company when it comes to taking care of customers. No company rule or policy is more important than taking care of their customers.